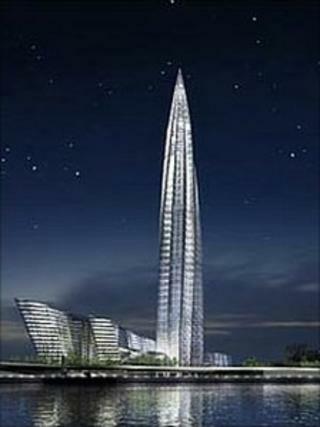 Image caption The Okhta Centre's was described as a "twisting glass needle"
Controversial plans to build a huge glass-and-steel skyscraper in the centre of the Russian city of St Petersburg have been scrapped. Governor Valentina Matviyenko said she and the state gas monopoly, Gazprom, had "reached a final decision to move this project to a different location". A previous decision to approve the construction of the 403m (1,312ft) Okhta Centre had prompted protests. Unesco had also said it could endanger St Petersburg's World Heritage status. The UN cultural organisation said the tower would dominate the canals and baroque buildings of the city, founded by Tsar Peter the Great in 1703. The Russian culture ministry also objected to the plans, as reportedly did President Dmitry Medvedev, who comes from St Petersburg. Prime Minister Vladimir Putin, also a native of Russia's second largest city, publicly backed the tower, which would have been built by 2016. After announcing her decision, Ms Matviyenko said the government would reimpose a ban on tall buildings in the former imperial capital that it had temporarily lifted to allow Gazprom to build the Okhta Centre. The skyscraper would cost some $2.4bn (£1.5bn) to build.